The trouble with making a brilliant debut feature film is what to do next. Jordan Peele’s 2017 movie Get Out was universally adored, did serious business at the box office and won an Oscar for its screenplay. Though ostensibly a horror, it brilliantly satirised the state of American race relations and suggested that even the most well-meaning liberals don’t know how to behave around black folk. In the era of Trump it seemed razor sharp, archly relevant, an instant classic. Now how on earth do you follow that? By doing something completely different, is Mr. Peele’s answer, because although Us expands on the doppleganger theme implicit in Get Out, it’s a bigger, bolder, weirder and more operatically creepy production altogether. Jordan is a big Twilight Zone fan, and will shortly be fronting up a TV revival of the 1960s sci-fi series: Us embraces the classic show’s off-kilter eeriness, and is based on a 1960 Twilight Zone episode called Mirror Image. Young couple Gabe and Adelaide Winston (Winston Duke, Lupita Nyong’o) have retreated to their coastal Californian beach house for a break with their children Zora (Shadadi Wright) and Evan (Jason Wilson). Gabe’s an affable, happy-go-lucky sort, but Adelaide is anxious, and something doesn’t feel quite right. In a haunting prologue, we discover that when she was a child, Adelaide got lost in a seafront amusement park and wandered into a hall of mirrors, where she met a little girl who looked exactly like her. She’s never quite gotten over the experience, and has been afflicted ever since by a creeping sense of dread. With good reason, as it turns out, because as they’re settling down one evening four shadowy figures appear in the driveway. They stand stock still, saying nothing, and when Gabe goes out to investigate, they attack him, then scatter, quickly infiltrating the house. And as a wounded Gabe retreats to join his family, they discover to their horror that the four intruders look exactly like them. They seem different, though, ragged, feral, communicating through screeches, snorts and grunts. Only the woman talks, in a scratchy, pained voice that suggests she hasn’t had occasion to speak in quite a while. The soliloquy she delivers is oblique but charged with menace: they’ve come from underground, and mean to usurp their sunkissed counterparts. Adelaide and the family manage to escape, but the dopplegangers follow. What’s worse, it’s an epidemic: when the family reach their friends Josh and Kitty (a dreadful, bitter, bickering pair hilariously played by Tim Heidecker and Elisabeth Moss), they quickly realise they’ve already been replaced. All over the State and possibly the country, lookalikes are lurching from the depths to kill. And as she fights for her life, Adelaide finds untapped reserves of strength but is troubled by new and lurid flashbacks. In Us, Jordan Peele proves once again that horror films don’t have to be stupid. On the contrary, supernatural stories can be the perfect template for metaphors, allegory, big political themes. In Get Out, white America’s inability to move beyond its fear and distaste for black people was the issue, but in Us, refreshingly, race is irrelevant. The Winstons are an American family that happens to be black, but their skin colour has nothing to do with their misfortune, which is universal. Apart from having a tremendous amount of fun on a bigger canvas, what Mr. Peele appears to be addressing here is iniquity, America’s growing underclass, and the worrying idea that if you live well, you do so at someone else’s expense. You could call them zombies, but the people from beneath could as easily be seen as the risen proletariat, and Us uses images from Adelaide’s 1980s childhood to imply that the present rot set in with Reagan. None of this, though, is conveyed in an obvious or heavy-handed manner, and could be blithely ignored by cinemagoers (God forgive them) in search of a good night out. Us is great fun, and very funny, and uses a banging soundtrack to very skilful effect. 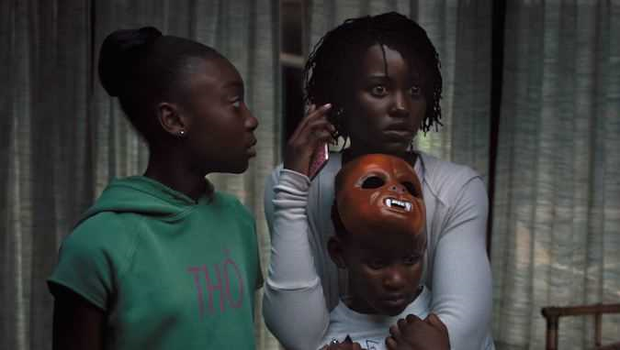 It also looks great: Jordan Peele has upped his cinematic game since Get Out, and this film is very nicely directed for the most part, beautifully photographed. Maybe the plot does become a little grandiose late on, but it would be churlish to criticise that and not applaud Us’s scope, and ambition. And what a performance, or rather double performance, from Lupita Nyong’o, who shifts with wonderful ease between the nervy, intuitive Adelaide and her terrifying, dead-eyed doppleganger. At any other time of year, there’d be talk of Oscars.